Look! Listen! Feel! The mic is always open... feed your soul! For weeks my sister and I were looking forward with childlike anticipation and excitement to Saturday, November 18, when Christine Caine and the Propel Women would be in town - at Mount Paran to be exact. That’s where the 2017 Propel Women’s Conference would be hosted. We were inebriated from the mere expectation of experiencing God’s presence in a real and profound way in the midst of a host of other women, each with a heart for God; so much so that the day before the event when we could barely contain ourselves we began to wonder nervously if it was even possible for the event to match our expectations. The day came. We went. And … it was incredible! Phenomenal! Fantastic! Incredibly fantastic! I mean I don’t have the words to describe just how spectacular and life-changing it was. First of all, there were over 3000 women in the sanctuary praising God; plus another 8-10 women ministering to the congregation; and then the Passion Band adding their blend of heavenly, explosive vibes to the whole experience. The atmosphere was electric. As Christine promised, it started on a high, and it just kept getting higher and higher and higher as the day unfolded. The Propel Women enjoy international acclaim for no other reason than they’ve earned it. There was nothing mediocre or ordinary about the event or the presenters. They operated with a pulsating mix of professionalism and playfulness that was, to me, simply perfect. What made it all the more amazing to me was that many of these women, who are now at the top of their game, had very troubled beginnings. There were stories of abandonment and abuse, teenage pregnancy and tragedies that could have completely derailed these women and prevented them from walking out God’s plans for their lives. But, they prevailed. And now all they want to do is glorify God, lead others to Christ, and help to restore those who have suffered at the hands of abusers. Heaven celebrates their fortitude - these unlikely vessels of love. I must mention Christine’s witty and skillful delivery of the “here/not there, now/not then” montage she created to convey the message that we should all use what we have now to do what God has called us to do. Why wait for a time or event in the future that is nebulous at best? Procrastination not only steals time that could be better spent honing the gift God gave each of us, but it also steals the blessings that such gifts bring. Her reference point for her message here was 1 Kings 17 showing the fruit of Elijah’s obedience, and within that, also demonstrated through an obedient widow that “impossible is where God starts, and the miraculous is what He does”. Christine shared experience after experience of how being faithful in small things opened up opportunities for greater things. And, of course, she did not let us forget that if you are busy looking down the road, you will miss the here and now, and if you miss the here and now, you will also lose the there and then (for which you did not prepare in the here and now). That lesson was the curtain opener for Sarah Jakes Roberts’ master class that explored what I call the Eve + Mary = the total woman equation. The total woman, as she evolves, more often than not exhibits schizophrenia at its best. This woman hosts Eve, the one who ushered sin into the world, and coexists in the same body with the Virgin Mary, the one who gave birth to Jesus, the Savior of the world! One woman introduced the world to sin; the other introduced the world to the One whose sacrifice gave us victory over sin. Sarah showed how one woman can be both Eve and Mary at the same time, and her assignment that day was to rescue Eve. Eve needed to be rescued because everybody dumps on her. Nobody takes the time to see things from her perspective. Eve gets lambasted left and right for what she did, especially by those of us women who don’t even realize how guilty we too are of similar behavior. By dogging-out Eve, we are dogging-out ourselves. Sarah wants us to allow the Eve in us to forgive herself and to let love smooth away the rough edges that a life of guilt has bred. That Sarah! She’s onto something here! The remaining presentations were just as mind-blowing. We also heard from Lisa Harper, Christy Wright, Shelley Giglio, LoriAnn Lowery-Biggers, Karen Harmon, among others. It really was incredible. At the end of the day, my sister and I agreed that this was an event well worth the wait. The experience far exceeded our expectations. 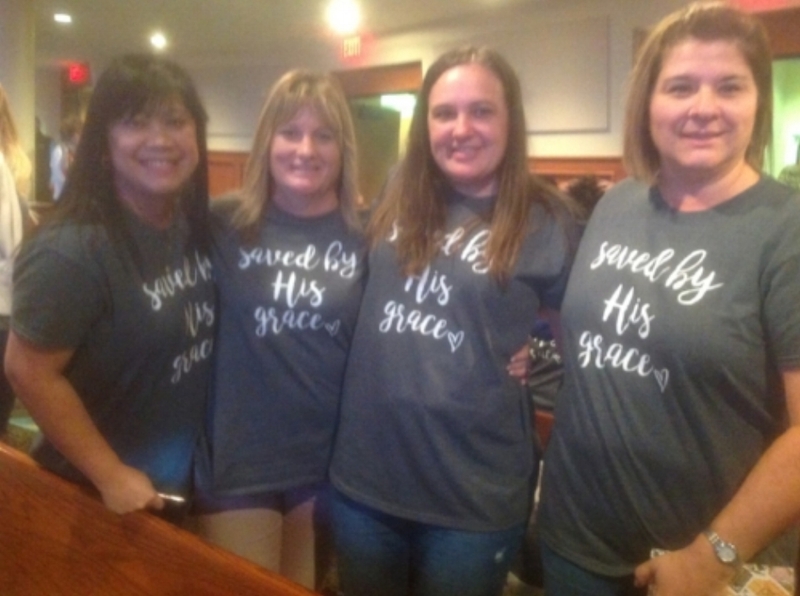 A small part of a contingent of women from South Georgia who came to declare that they are “Saved by His Grace”.